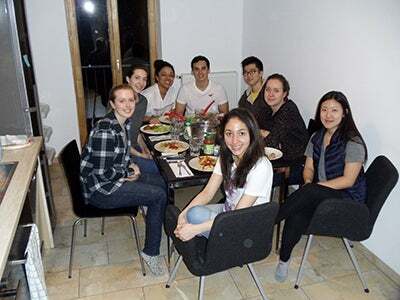 Undergraduate student Linda Zhang blogs about studying abroad at NYU Prague. I’ve noticed that I’ve started referring to Prague as “home” more often over the past few weeks. After being away for a long weekend, I feel this sense of comfort or familiarity in returning to Prague and the quaint location of my dorm. Hello again, and welcome back to my blog! 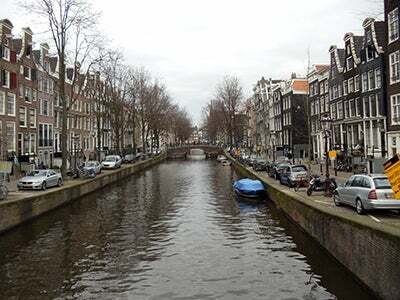 Since my last post, I have traveled to Budapest, Amsterdam, and London, so this installment will be travel-heavy, focusing on my adventures in those cities. 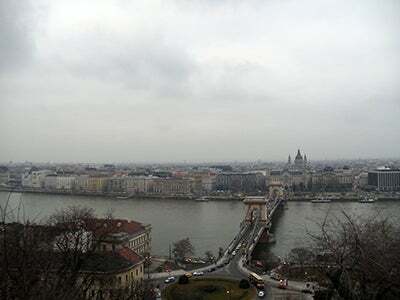 Budapest was my first trip outside the Czech Republic – the 7-hour bus ride was totally worth it! 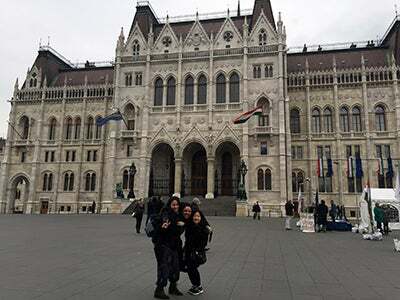 On our first day, we took a free walking tour of the entire city and hit all of the sightseeing destinations that included: Castle Hill, Fishermen’s Bastion, Chain Bridge, Parliament, Royal Palace and St. Stephen’s Basilica. My favorite stops were Castle Hill and Fishermen’s Bastion, which provided incredible views of both sides of the city (Buda and Pest). We were also able to walk over the bridge in the evening just as the sun was setting. Getting to see the city light up over the water was definitely a treat! 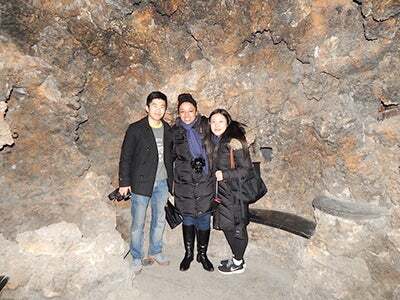 At night, we visited a “ruin bar,” a famous kind of landmark in Budapest for its history. Ruin bars were constructed from buildings in the Jewish quarter of Budapest that were nearly destroyed during World War II. The buildings were renovated just enough to be operable, but maintained an overall distressed look that makes for a cool and hip vibe and memorable cultural experience. 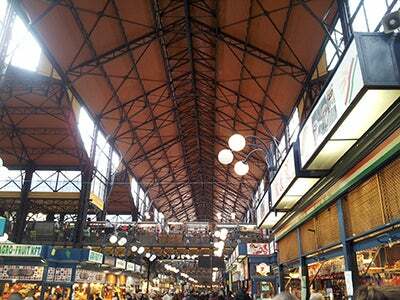 The next day, we went to Central Market Hall, a bustling indoor market, and had some Hungarian food for lunch. In the evening, we went to another one of Budapest’s famous attractions – a bathhouse. It was very relaxing and a great way to wrap up the trip. Amsterdam was basically a lot of walking (over canals), eating, and stopping for coffee and pastries…not that I’m complaining! On the first day, I visited Anne Frank House with my roommate Noheli, but not before we discovered the Amsterdam version of New York’s “Grey Dog” called “Drovers Dog” for brunch with the rest of our group. The food was delicious! Anne Frank House was quite a unique experience. It was so unreal to me to be standing in the same place that she once lived. The exhibit was informative, engaging and thoughtfully constructed. 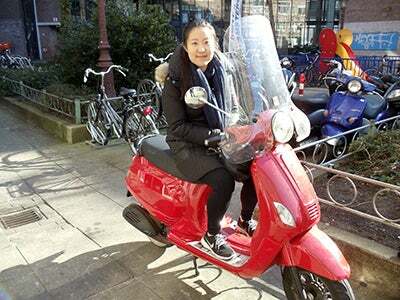 Another highlight of this trip was mopeding around the city with my friend Maggie. Amsterdam is known to be a predominantly biking city, but we decided to try mopeding while a few of our friends biked instead. The experience was both exhilarating and terrifying, since it’s much more difficult than it looks to operate and drive the bike! We spent a lovely afternoon riding up and down the river and exploring the city in a different, adventurous way. Touching down in London was definitely more comforting and welcoming than my previous destinations, since I was relieved to remember that I was in a place that spoke English! 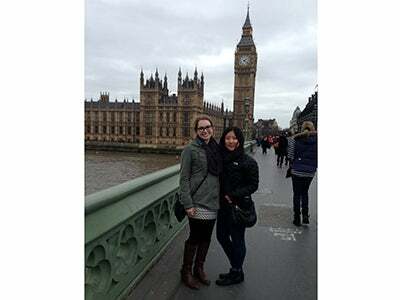 This trip was particularly special because we were able to stay with friends at NYU London. London also didn’t feel as foreign to me since it reminded me so much of home. 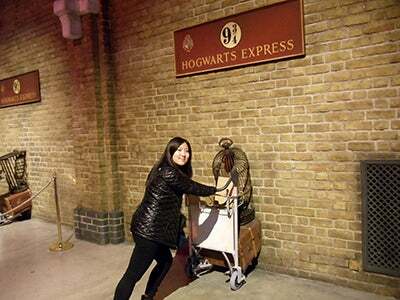 I traveled with my friend Wynonna, and we were very excited to visit the Warner Bros Harry Potter studios in Leavesden on our first day. We got to tour the expansive set stages and see everything that went into making the films (as well as take our iconic photos at Platform 9 ¾!). 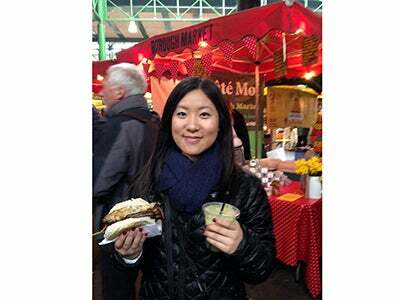 We started the next day early with a trip to Borough Market. I had a very tasty sausage and bacon sandwich and fresh juice to fuel me up for an entire day of sightseeing. 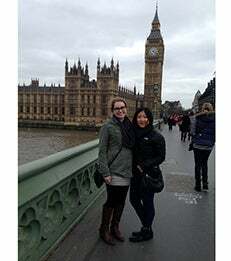 We tried to hit as many sites as possible, such as the London Eye, Big Ben and Parliament, Westminster Abbey, and Oxford and Piccadilly Circus, with afternoon tea with friends in Covent Garden. We also saw Buckingham Palace and the Tower Bridge at night, and I especially enjoyed stopping by the bridge since the view reminded me of night runs along the river back home. We ended the night at a restaurant called Dishoom that served Bombay street-car-style food. The food was amazing, and the atmosphere was eclectic and authentic. I’m halfway into the semester now, and I’ve noticed that I’ve started referring to Prague as “home” more often over the past few weeks. After being away for a long weekend, I feel this sense of comfort or familiarity in returning to Prague and the quaint location of my dorm. Dobry den (Hello)! My name is Linda Zhang, and I’m a sophomore at Stern concentrating in Marketing and Management with a minor in MCC (Media, Culture, and Communication). 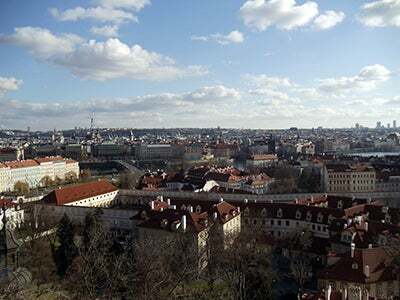 I’ll be spending this semester at NYU Prague, and I’m excited to take you along with me on this whirlwind of an adventure, as well as use this blogging opportunity to step back and reflect every few weeks on my experiences. 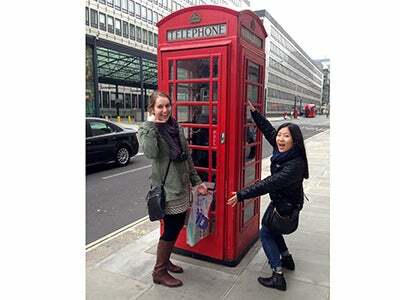 I hope the tidbits of my semester that I share with you will give you some insight into the study abroad experience at NYU! After braving fifteen hours of travel and jet setting through three time zones, my roommate Noheli and I finally touched down in Prague. Just a few hours after we arrived at our dorm, one of our Resident Assistants, Kuba, took some residents on a “survival walk” of the area. The first stop was a park (think a smaller version of Central Park) right around the corner with an expansive view of the city from above a patch of vineyards. I didn’t expect Prague to be so elevated. By the end of my first day, I had already noticed other idiosyncrasies of the city such as unleashed dogs, people frequently crossing streets without stop signs or street lights, an emphasis on being “green,” and mandated quiet hours, not to mention all the cobblestone! 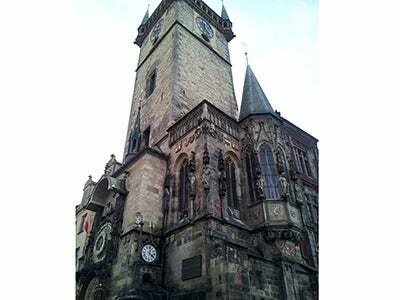 Orientation week was jam-packed with everything from intensive Czech history and language classes to visits to iconic destinations in Prague such as the Charles Bridge, Prague Castle, and Astrological Clock Tower. 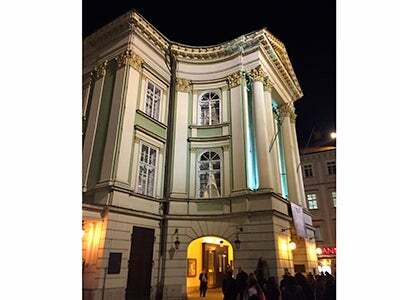 I also got to see a ballet called Valmont at one of Prague’s famous theaters. In terms of academics, I enjoy and appreciate that class content is put into a Czech context. There is so much rich history in this city, and you gain a different perspective from viewing class content through that lens. In addition to taking two standard Stern core classes (Intro to Marketing and Organizational Communication), I have two other electives that are heavier in the social sciences than I’m used to, which I think is a nice change. In Media and Cultural Analysis and a NYU Gallatin seminar titled “Modern Dissent” (led by a dissenter himself), we unpack complex ideologies such as communism, Nazism and totalitarianism, and examine the social, cultural, political and/or economical implications. My Media and Cultural Analysis professor even wants to schedule an excursion for next class to see some physical artifacts of Marxism in town. Although I’m looking forward to more free time while being abroad, I still want to keep myself busy. I’ve joined the student council as a general representative as another way to help facilitate community building among NYU Prague students. Since I’ve decided not to intern while I’m here, I’m balancing that out with volunteering ventures. I’ve signed up to help teach English to Czech schoolchildren, and I will be attending an interest meeting info session next week to do the same kind of thing with Czech university students. I’m excited to get involved in these initiatives because I’ll be able to learn and practice more Czech and immerse myself more fully in the culture while helping the natives with their English. NYU is also sponsoring “Czech Club” for students who want to continue to learn Czech, but don’t have room in their schedules to take the actual class. Based on previous roommate experiences, I got a bit nervous when I found out that my roommate and I were going to be living with four other girls. I didn’t know what to expect of the situation, but I guess we got lucky because we all get along great and have formed our own micro-community of six. It’s so nice and refreshing to be around people outside your major (and outside your school). It makes for good, funny, memorable conversation. We’ve also created a tradition of potluck dinners, which started at the end of the first week when we were too exhausted to go out yet again for another meal. We ended up cooking together as a suite and invited a few of our friends from another dorm to join us. It turned out to be a nice evening and reminded me a bit of Sunday night dinners at home. 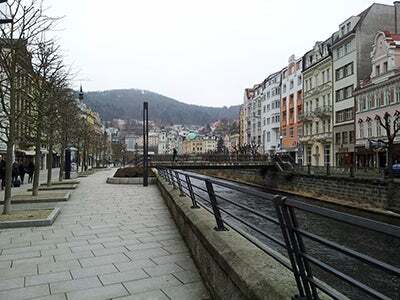 So far, I’ve traveled to Karlovy Vary, one of three spa towns in the Czech Republic, on a NYU-sponsored overnight trip. 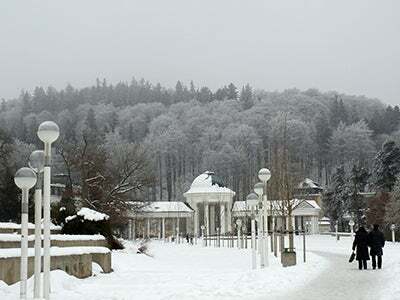 The town was peaceful and beautiful, even if it was freezing cold and the second town we visited on the way back was very snowy! 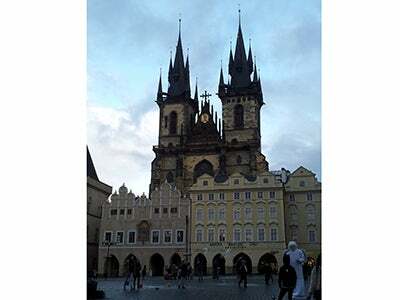 Now that I’m starting to get more acquainted with Prague, I’m ready to travel outside of the Czech Republic. In two weeks, I’ll be going to Amsterdam, and some other destinations potentially coming up are Vienna, Budapest, Istanbul, and Croatia. Overall, my general impressions are that Prague is similar to (the public transportation system) yet different from (restaurant etiquette, coffee strength) New York. There are things that I love about Prague, but already miss about New York. 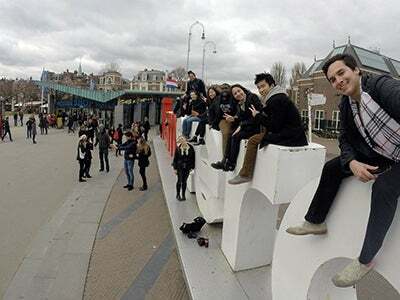 However, I think ultimately that’s why I chose to study abroad at this site. As a fellow Sternie put it, it’s the right amount of uncomfortable, and you can acclimate at your own pace. I’m excited to see where pushing myself even further out of my comfort zone as the semester progresses will take me!